As I mentioned in this post, earlier this month I had decided to whip up a matching project bag and notions pouch set as a gift for the Bitchy Bees' Christmas potluck. I wanted something a little more special than the project bags that I've been making lately so I opted to making a bag that was larger than my standard project bag, one that was big enough to hold a project as large as a sweater. I used a print from Etsuko Furuya's Echino Spring 2010 fabric collection. I love the fabrics that she uses and every single print that she has ever designed. The fabric that I used for both the pouch and the bag has such a beautiful thickness to it that I think really helps the bag hold up and keep its shape. I also think reinforcing the seams with bias tape not only helps it to stay boxy when not in use, but also help make it more durable after regular use. 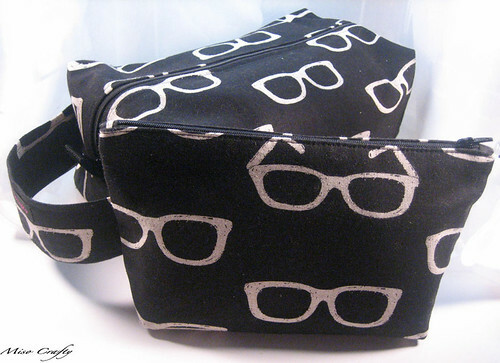 I used a solid black cotton fabric for the lining, that way I wasn't taking the attention away from the outer fabric when the bag was open. When I had sewn in the zipper I was trying to unzip it so that I could topstitch one side of the zipper only to find that I had nothing to grasp onto. So I added 2 tabs, one at each end of the zipper instead of just the one at the opposite end of the handle, to help zip and unzip the zipper. 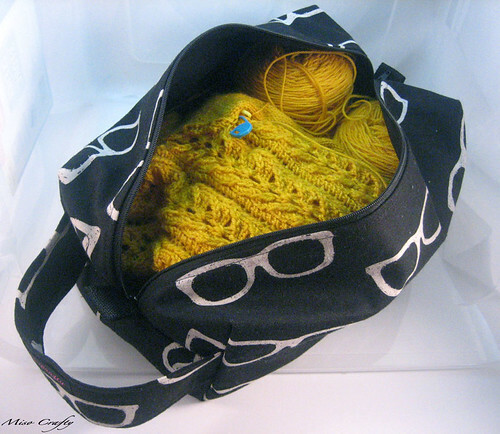 You can't really tell by the photo above, but the bag is definitely much bigger than my regular bags, so big that I can fit 2 yarn cakes and an almost finished cardigan in there! At one point I had managed to stuff in 3 cakes, the cardigan, and a pattern - unfolded and in a page protector, all with ease. I loved how the bag turned out so much that I just had to make myself a bag too! I didn't think the project bag was enough as a gift on its own (in hindsight, it probably was and I was definitely underselling myself! 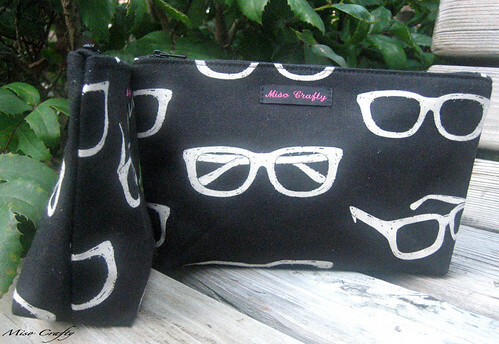 ), so I made a matching notions pouch to go with it. Again, I loved how it turned out that I had to make myself one too! The photo at the top of this post makes the pouch seem much larger than the project bag (the photo was taken at a weird angle), but really the pouch can fit inside the bag quite nicely. The notions pouch is also lined in the same black cotton as the bag and has an interlining of heavy cotton canvas to make it sturdy. 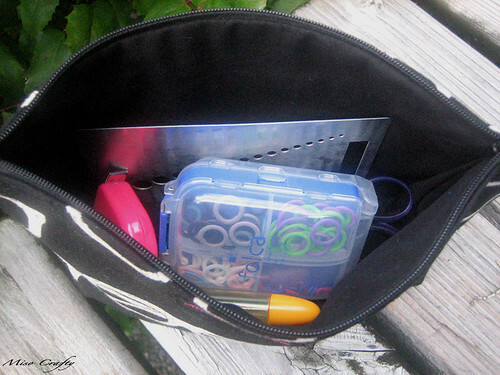 It's large enough to fit the pouch that I was previously using to hold some of my notions, as well as my Folca box full of stitch markers, a measuring tape, scissors, Chibi needles, a crochet hook, a needle/row gauge and ruler, and a few pens, with plenty of room left over for more. If you look closely, the pouch is actually a smaller version of the very first project bag that I had made last year. I really proud of this set and love how they both turned out that I'm thinking about making a few more in the new year. Well, maybe not so many of the extra large project bags, since they use up a lot of fabric, but definitely the pouches. So stay tuned for new ones to pop up on this here blog. In the meantime, I've decided to take a mini break from sewing for the rest of the year (I can handle not sewing for almost 2 weeks, right?) so that I can enjoy the holidays and try to get some much needed rest. I do have a lot of projects in mind that I can't wait to get started on and definitely see a lot of craft goodness for the new year. Yay! YES you are underselling yourself! These bags are THE hot item at the Christmas gift exchange!